It occurred to me today that I hadn't written here about a lovely trip I took this July to Winchester, Virginia. It was what I call a clean-up trip: I've been to Winchester a few times but didn't get through all the stuff on my list. I just wasn't satisfied that I'd gotten everything out of it that I could have or should have. So I went back. Winchester is only about an hour and fifteen minutes or so from here (Arlington). It was a fantastic day and a fantastic trip. I started at the Museum of the Shenandoah Valley and spent a lovely morning walking through their gardens. It was overcast and a little damp, but the light was good and I was the only one there, so I could wander at my leisure around the formal gardens, the bowers, the kitchen garden, the knot garden, the Asian gardens . . .
After I got my fill of plants--which took quite a while, actually--I drove into town and parked near George Washington's Office Museum. It's a delightfully small 18th-century building preserved from the colonial days when Winchester was a fort town and on the frontier of British settlement. It saw action during the French and Indian War, when ol' Washington himself used [part of] the building as his office. I liked the feel of the place in general but the examples of surveying equipment in particular. My next stop, and the source of the above picture, was the Old Court House Civil War Museum in the heart of Winchester. As the name implies, it's a museum housed in the old court house. As it's website (http://civilwarmuseum.org) states, Winchester changed hands over 70 times during the Civil War. It was a very active spot, being at the top of the Shenandoah Valley. The Valley a major thoroughfare for the Confederates in particular, and they popped in and out of the Valley at its northern end, near Winchester (they also popped in and out of the passes up and down the Valley) as they made attempts to invade the North. The Valley was also important as a bread-basket. The North made some attempts to quell the Valley but was largely focused on the Eastern Theater over the mountains. It wasn't until summer/fall of 1864 that the Valley was finally conquered. The Union Army quite purposefully left a path of destruction in its wake. The result was similar to Sherman's famous March to the Sea. I'm not sentimental about this sort of thing: the destruction of crops and supplies that might have been of use to the Confederate Army was the price of supporting the Confederacy, or maybe just the price of war. In any case, the museum is dedicated to the war in the Shenandoah. I chatted with the lady at the front desk about my three-times-great-grandfather, who fought in the Shenandoah on the Union side as a cavalry blacksmith. She invited me to go on upstairs to the museum proper and to ring the old bell--just once, though. I gave the rope a good tug, and it gave a satisfying bong as I stood below and smiled up into its cavernous underside. Again, like in the gardens that morning, I was left to my own devices in a wonderland of delight. Minie balls and rusty cavalry swords and guns galore, oh my! Either the museum was in between exhibits, or they always have rather haphazard paper information plaques. I kind of think it was the former, since I can't imagine the paper signage was permanent. While there was signage for everything, it all seemed delightfully disorganized. I mean, there were swords with swords and cross-sectioned artillery shells with other artillery shells and whatnot, but each item wasn't carefully segregated from the others and stuck on a pin. And there was lots of everything--hundreds or thousands of bullets, scores of guns, hundreds of buckles, dozens of spurs, most of them found on or around the battlefields of Winchester (there were three Battles of Winchester and many more skirmishes). The volume was a reminder of what a massive thing the war really was. There were millions of men involved, and they left behind a trace behind them. Just think of the men who were firing those bullets or--worse yet--being struck by them. A case in point is the buttons. The picture above is just how the buttons looked--and there were several displays like this one, just crammed with buttons--buttons and buttons and buttons, all of them off of some man's coat. 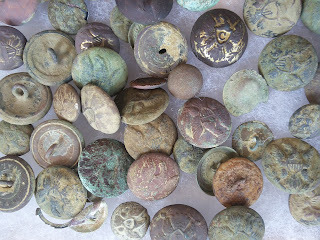 There were eagles and shields, and buttons with insignia. 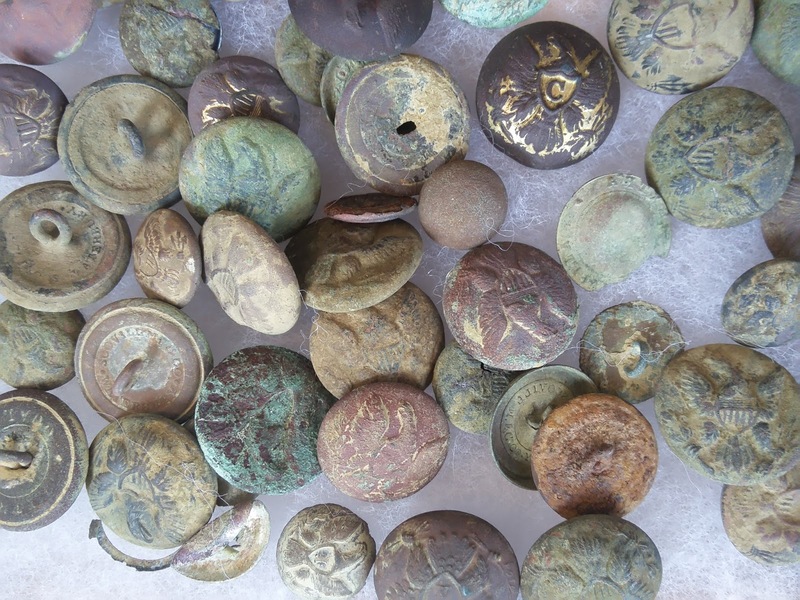 They're slightly tarnished and worn, and if you them on a peg in neat rows in a case, they would just look like old buttons. Somehow, jumbled together, their colors make them into artwork. When they're together, you get a real sense of what these items were and how many men were there. Kind of cool, isn't it?